On Nov. 10, we'll all be treated once again to one of the most chaotic, entertaining, and politically depressing TV events in American life — that's right, it's the fourth Republican presidential debate. This time it'll be hosted by the Fox Business Network and The Wall Street Journal, and the stage will look a little different than last time, since the polling requirements for participation have tightened. So, what about a certain former Hewlett-Packard CEO? 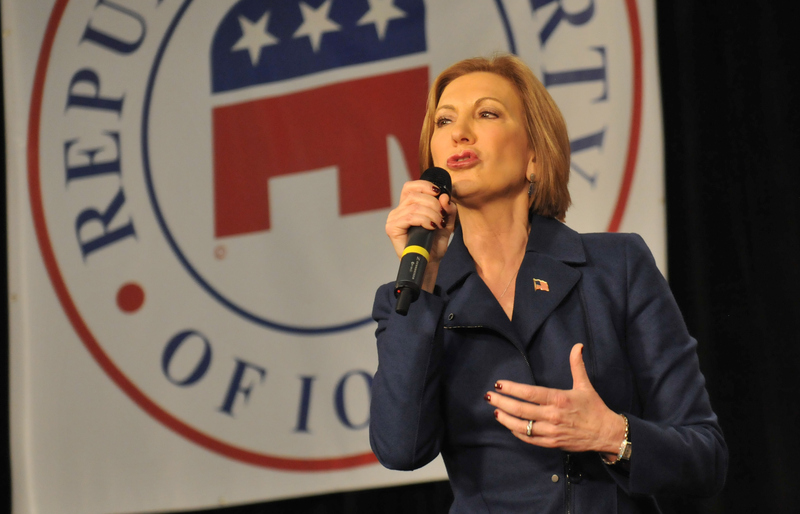 Will Carly Fiorina be in the primetime debate, or will she have to return to the dregs of the undercard debate? It has been a tough several weeks for Fiorina, there's no denying that. After her debut performance on the big debate stage in Simi Valley on Sept. 16, which earned her a lot of buzz as a potential up-and-coming contender, the bottom has seemingly fallen out — her poll numbers are hovering in the low-single digits. But for the time being, at the very least, she's got nothing to fear — with a national polling average of just over three percent, she just made it across the finish line to participate in next week's face-off. The FBN/WSJ debate rules contain a 2.5 percent minimum cutoff for the main stage, and a one percent cutoff for the undercard. Former main stagers Mike Huckabee and Chris Christie fell into the undercard group as a result of this, and former JV star Lindsay Graham is now out of both debates altogether. In other words, while her presence might be assured for the time being, Tuesday night will be pretty huge for Fiorina. Whatever you might think of her politics and her statements in the past two debates — her factually challenged broadside against Planned Parenthood still stands out — there is a grain of truth when she describes herself as "Hillary Clinton's worst nightmare." As a former corporate leader with no political experience at any level, she's at least theoretically well-positioned to fill that outsider's role that GOP voters have seemingly sought with with Ben Carson and Donald Trump. And, needless to say, a Fiorina/Clinton match-up would ensure that a woman would be elected president in 2017, undercutting the uniquely historic nature of Clinton's candidacy. And yet, despite being in pretty dire straits as far as the field's electability goes, primary voters seem to have given Fiorina the once-over and said "thanks, but no thanks." Whether she can turn things around with a headline-grabbing performance this Tuesday will be key — it's airing at 9 p.m. ET, 6 p.m. PT.